The most famous crop in North Georgia may be our crisp apples, but you’ll also find plenty of other farm-fresh fruits, veggies and seasonal goodies ripe for the picking! Food in its natural state … no packaging … no preservatives … just juicy goodness. That’s what you’ll find on the North Georgia Farm Trail — whether you’re picking plump blueberries at a local berry patch, choosing sweet Silver Queen corn at a roadside farmers market or plucking crisp, red apples right off the trees. When you buy your produce straight from a local farm or orchard, you are simply getting better-tasting, fresher fruits and veggies. And, chances are, they’re better for you, too, with fewer pesticides and less processing than you’ll find in a typical grocery store. Whatever you’re looking for, you’ll find plenty of pick-your-own opportunities along the North Georgia Farm Trail. Of course, there’s no rushing Mother Nature, so be sure to check websites or call ahead for picking events and schedules. 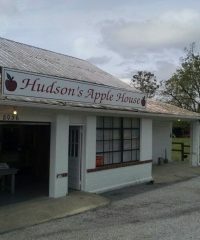 Stop by this working apple house on Hwy. 52 in Ellijay, Georgia, when you’re looking for some fresh apples, jams, cider and more. Southern comfort food, cider, seasonal vegetables and fruits at our farmers market, and U-pick apples.